Allianz Global Corporate & Specialty (AGCS) has successfully trialled Blockchain technology for a global ‘captive’ insurance program including cash transfer between countries. 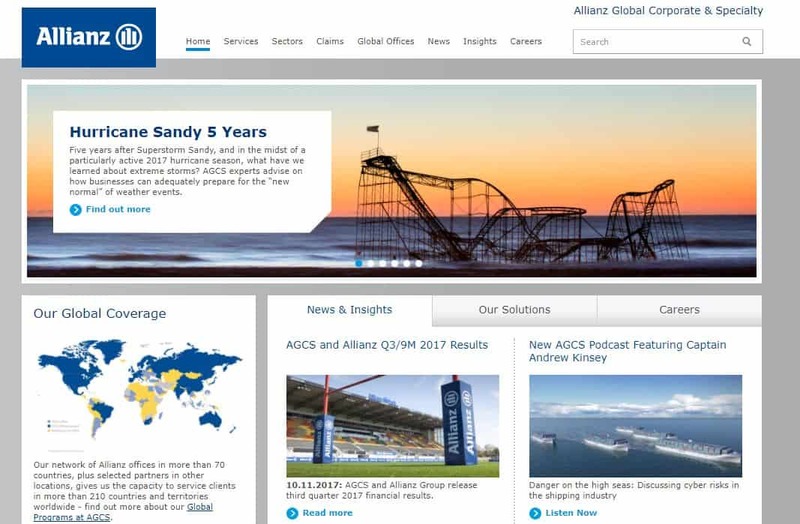 AGCS’s Allianz Risk Transfer (ART) line of business has teamed up with EY (Ernst & Young) as Blockchain advisory service provider and digital agency Ginetta to successfully create a Blockchain prototype solution (click for demo video) for the existing captive insurance program of a long-standing ART customer with global reach. In connection with this prototype, ART also joined forces with Citi Treasury and Trade Solutions, which provided the payment processing services related to Allianz’s Blockchain prototype. The results prove that Blockchain technology can greatly improve the efficiency of corporate insurance transactions internationally. Captive insurance programs are one of the most complex areas of commercial insurance. They are established by multinational organizations that self-insure instead of purchasing insurance. They create their own self-insurance programs or ‘captives’ that pool together selected assets or insurance exposures from their global operations, collecting premiums from each of their operating companies and paying out claims internationally as they arise. These captives may cover over 100 countries and hundreds of millions of dollars of insured assets. As a “fronting insurer” Allianz partners with the captive owner to administer each program, using the insurer’s international network in 210 countries and territories to fully comply with local regulations. Blockchain technology automatically connects all parties involved in the captive insurance program – the captive management, local subsidiaries and the fronting insurer. Blockchain is a distributed ledger which is shared among a network of participants and can record transactions and data entries. Any updates or changes to the data are shared in real-time across all users. This creates a much faster, transparent, secure and efficient means of distributing information, conducting business processing and recording transactions across multiple parties. The Allianz captive insurance Blockchain prototype, built on the Blockchain framework Hyperledger Fabric 1.0, focuses on two types of insurance policies – Professional Indemnity and Property – for a captive insurance program with local subsidiaries in the US, China and Switzerland. The prototype looks at three common process flows in the captive insurance cycle – annual policy renewals, premium payments and claims submission and settlement. It translates these processes into the distributed ledger environment decreasing the time from start to policy, policy to premium and claim to settlement. To process payments related to Allianz’s Blockchain solution, Citi Treasury and Trade Solutions leveraged its CitiConnect Application Program Interface (API) solution to accept payment instructions from Allianz’s captive insurance Blockchain prototype. This connection allows Allianz to communicate directly with Citi, beginning with US dollars and eventually extending into more markets within Citi’s global network. “Citi is very proud to have been able to help Allianz achieve this industry milestone. By leveraging innovative, new technologies such as Allianz’s Blockchain prototype and CitiConnect API, we are able to partner to design new business models and rapidly implement them in a matter of weeks,” said Tapodyuti Bose, Global Head of Channel, Enterprise and Account Services, Citi Treasury and Trade Solutions. The digital agency Ginetta designed the intuitive, convenient user interface that incorporates the requirements of ART and its captive client. It visualizes core processes, and through real-time information allows tracking their progress by all relevant stakeholders around the world. Before creating the user interface all processes of captive insurance management have been reviewed, redefined and radically simplified. “With Blockchain much focus is put on the technology, yet in reality perhaps 10 percent of the work is related to technology. The other 90 percent is rethinking the underlying processes and these in the end are all about people,” says Alan Cabello, Project Lead and Innovation Manager, AGCS Central and Eastern Europe. ART has already successfully tested Blockchain technology, when partnering up with Nephila Capital Limited to successfully pilot the use of Blockchain technology for transacting a natural catastrophe swap. In addition, Allianz SE is part of the B3i initiative, the Blockchain Insurance Industry Initiative, which recentlylaunched a reinsurance Blockchain prototype.